The Counterforce project is now on the home straight. Not much more to do and i’ll consider it a another project completed. I’m looking forward to actually playing it. First (and biggest) task to look at for this update is rebuilding the lower set of flippers. The flipper bats are dirty and will need a good clean. The others came up nicely, so I expect these will too. The rubber is long gone but easy enough to replace. The playfield area around here also needs a good clean, which I’ll do once the bats are removed. The drop target bank has waited, or more accurately, been put off for, long enough. Time to pull the assembly to pieces and clean it all. 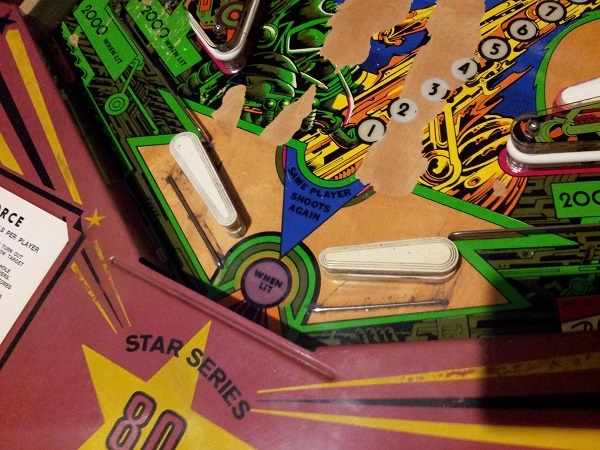 When I first got the machine home, the 6th and 7th yellow drop targets were broken. 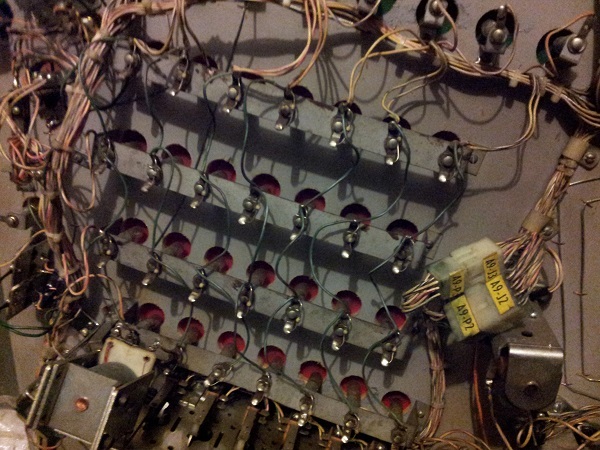 I replaced these back in update #2 so I could start a game and test out the switches. At this point, the drop target bank functions correctly. That includes all switches. So this is a good starting point. If I mess anything up in rebuilding the assembly, I’ll know it’s my fault. 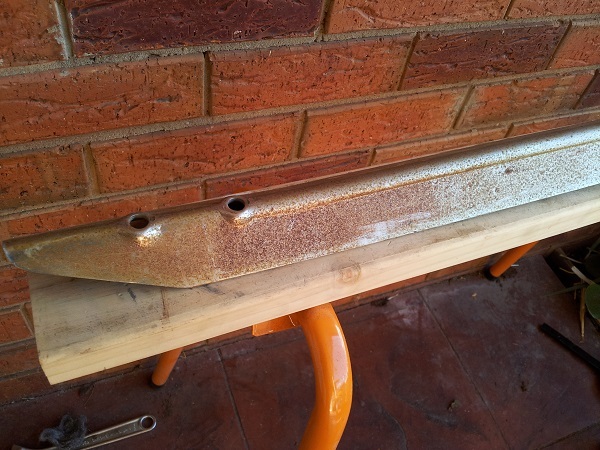 The plastic, posts and old rubber had been removed awhile back. This photo is also from awhile ago too as you can see all the areas around the drop targets are incomplete (but have since been finished in previous updates). The Counterforce to do list is beginning to thin out and I’m looking forward to (hopefully) having it knocked over in the next few weeks. Although as it turns out, in this update, I do a few extra things I had originally decided not to – but it’s worth the time. First on the hit list for this update is the pop bumpers. They need a proper service. I think they are many, many years over due for one. 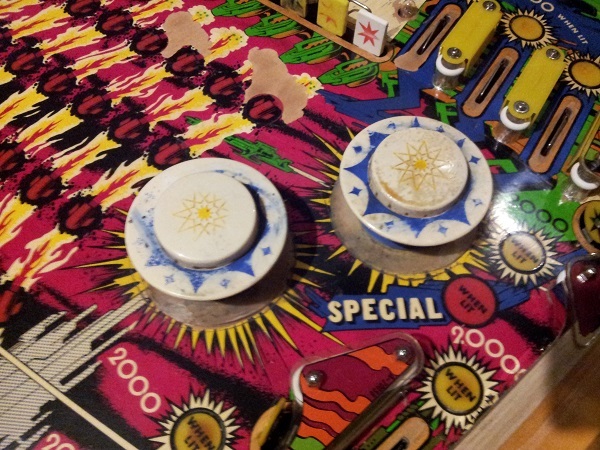 There are two pop bumpers located on the playfield and at first glance, they have been well worn over the years. The caps have some sticky crap attached to the top of them. 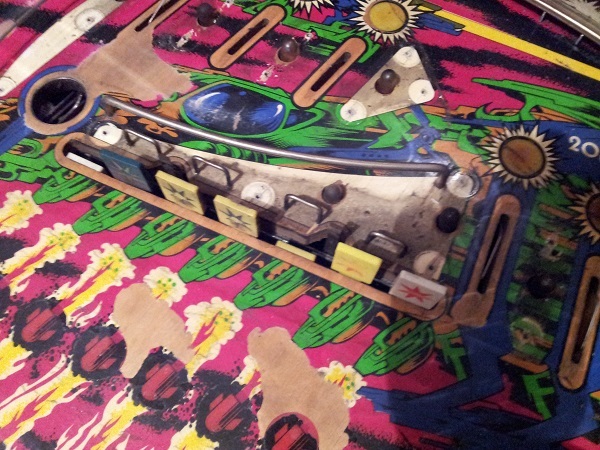 The decoration is wearing and there is some serious playfield wear below the (once clear) platters.